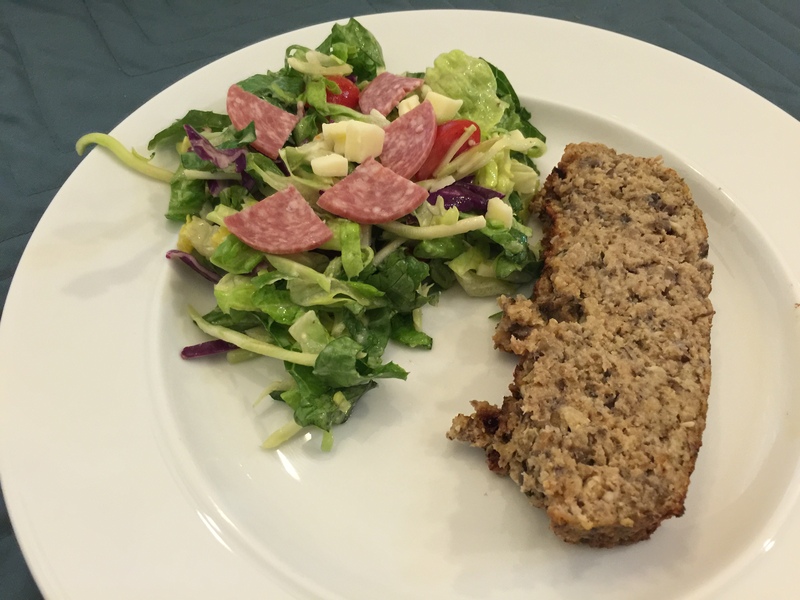 This turkey meatloaf turned out much better than I had hoped. What made it quite good was chopping about 3/4 lb. crimini mushrooms very finely in the food processor and the sautéing them until they were dry. Also finely chopped onions and garlic were added to the sauté. Mixed together some pano breadcrumbs, eggs, and milk. When the mushroom mixture cooled down, I added it and the breadcrumb mixture to a 20 oz. package of ground turkey (Costco). Salt, a little ketchup, Worcestershire sauce, and my secret ingredient for making everything have a depth of flavor, fish sauce, rounded out the components of the dish. Cooked it for 50 minutes at 400F and it turned out really well! I will probably make this again adding some chopped parsley and maybe some sort of nuts for a little crunch. This entry was posted in Poultry and tagged ground turkey, mushrooms, Onions, Salad. Bookmark the permalink.